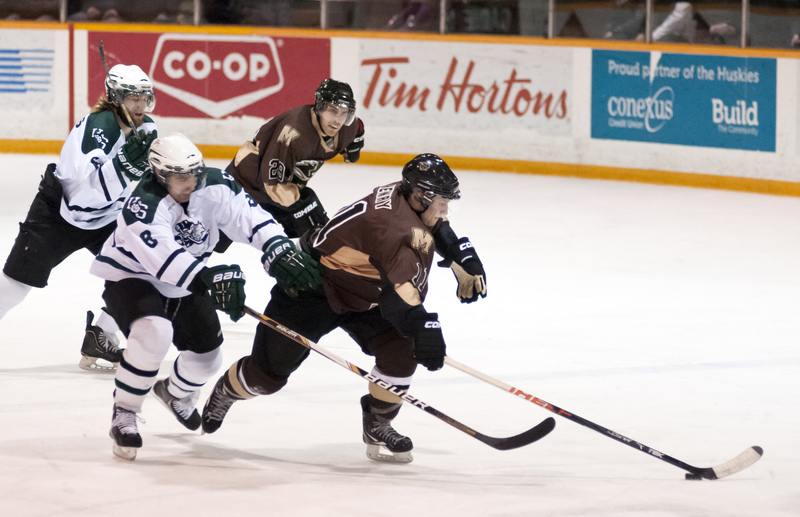 Coming off of two tough losses at Calgary to start the 2014-15 Canada West hockey season, the Manitoba Bisons channelled their frustrations at home this weekend, sweeping the Regina Cougars in a weekend set. Manitoba outscored Regina 10-1 over the two games, displaying their scoring touch. Friday’s game featured three goals in two separate periods for Manitoba, as they completed a 6-0 shellacking of the Cougars, which saw six different players score a goal. Manitoba got on the board just 3:56 into the game, as last year’s points leader Aaron Lewadniuk notched his second goal of the season. Jordan DePape would add his first of the campaign exactly one minute later on the power play. The Bisons led by two not even five minutes in. The Bisons would chase Cougars goaltender Lucas Gore from the game at 17:45 of the first frame, after defenceman Brock Sutherland pounded a shot into the back of the net. Manitoba had a chance to add to their lead in the second, going on a five-on-three advantage for just under a minute; however, Mitch Kilgore—Gore’s replacement in net—stood strong. The third period was déjà vu for the Cougars, as Manitoba added three more goals, with two coming in the first five minutes. Shaquille Merasty would score the Bisons’ second power play goal at 1:41, capitalizing on a Reid Gow rebound, and Kyle Rous made things 5-0 at 2:48, finishing off a spectacular pass from Jesse Paradis. The scoring was capped off at 10:03, as Dustin Bruyere tipped in a Joel Schreyer shot to make the final 6-0. Deven Dubyk was poised in net for Manitoba, stopping all 25 shots he faced, including a five-on-three early in the third period to grab his first win of the year. Saturday was much of the same for Manitoba, as they opened up a 3-0 lead after two periods and never looked back. DePape got things started for Manitoba at 4:13 of the first, as the Bisons pressured Regina with nine opening period shots. The Cougars responded with six shots of their own, but Dubyk remained solid between the posts. The Bisons essentially put the game to rest in the second period, scoring two goals just over a minute apart. Merasty added his second goal of the series at 5:41, after some brilliant stickhandling, and Taylor Dickin would make the score 3-0 on the power play at 6:55. It was a rough weekend for Gore, who, after the Dickin goal, was relieved of his duties in net for a second consecutive game. Regina would finally solve Dubyk at 15:44 of the third, as Tyler Penny ended the bid for a second consecutive shutout. It was too little too late for the Cougars, though, as the Bisons would add an empty net goal from DePape, making the final score 4-1. Manitoba’s four alternate captains all had a big impact over the weekend. DePape led the way, producing five points over the two games, while Paradis and Sutherland each had two points—Sutherland with a plus seven rating—and Luke Paulsen had one point. Merasty also had an impressive showing, with four points, and a plus four rating. Manitoba will hit the road again this weekend, taking on the Saskatchewan Huskies. Game times are 8 p.m. on both Friday and Saturday.